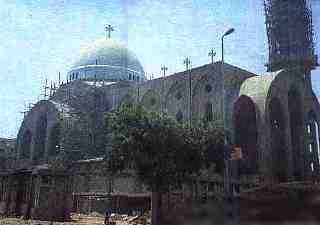 Immediately after taking his seat, His Holiness Pope Shenouda III began constructing the Cathedral of the Virgin. The Buildings, up till now, have cost two million pounds. The finishing touches, however, still remain to be completed. Every Friday and Sunday, more than 4000 people attend mass. They also attend evening mass on Sunday and Monday evening. The cathedral is surrounded by rooms for the different activities, a big hall for weddings and funerals, and an automatic bakery for the 'Corban'. The building, round the Cathedral includes two homes for the old (one for men and the other for women), a lodging house for young women who come from outside Cairo, nursery classes, and clinic named after Virgin Mary where everyone is given free medical treatment, and the poor are given free medicines as well. There is also a workshop for the manufacture of candles and another one for the manufacture of carpets. Everyday of the week, and throughout the whole week, there is a liturgy every morning, and a sermon every evening. There is also the Committee for Charitable Purposes that helps the poor. Wednesday evening is set aside for the solution of problems. People come from Upper and Lower Egypt and place their problems at the Virgin's altar. Up till now, miracles still happen, in accordance with what the Book says: "And these signs shall follow them that believe," through the mediation of the blessed Virgin Mary. May God be glorified for ever, Amen. + The explanation of the Bible. + Preparing those who intend to serve in Church. I. Providing suitable lodgings for female students. II. Taking part in the expenses of marriage or engagement for needy persons. III. Payment of the debts of the insolvent. IV. Buying blankets and quilts for the needy. V. Paying the fees of the cases presented before courts of law for needy persons. VI. Providing certain families with sewing machines to help them earn their living and provide for themselves. VII. Paying the school fees for certain destitute persons. VIII. Providing poor university students with reference books. IX. Offering the unemployed opportunities of work.